Not only human follow the fashion trends, our four legged friends also be part of it. 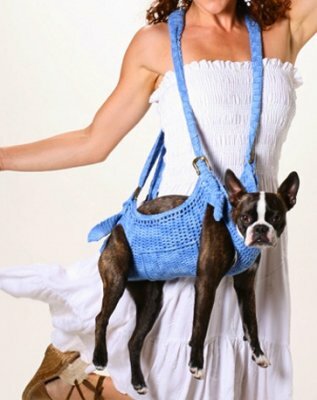 A new carrier has been designed especially for pets and is being said to be the first hands-free of carrying our four-legged friends. It was designed by dancer and dog lover Shannon Beach, who owns a shih tzu, Ted D. Shannon said: ‘It was created out of necessity. I couldn’t find a carrier that suited my active lifestyle and was fashionably appealing. My vet told me the best way to carry a small dog is on your forearm with legs hanging on either side. I used this concept for the base of the product, which distributes their weight evenly. Then I added straps so I could free my arm, making it hands-free. ‘When I saw it made people laugh, it was obvious I had created a unique business opportunity. Shannon crocheted about 50 slings to experiment with different materials before finding a company in Hong Kong to manufacture the Puppoose. It costs £37 and comes in four sizes and a choice of colours. It can carry dogs weighing up to 22lb. 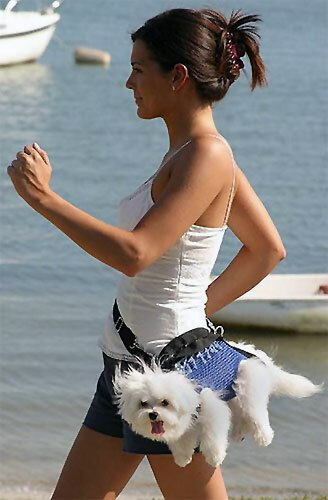 This design also get a lot of negative feedbacks from the public saying walking the dogs should allow the dogs to feel and touch the ground instead of swingging them around our waist.